Accounting students at Dixie State University's Udvar-Hazy School of Business, in conjunction with the Dixie Business Alliance, provide an intensive short-term training environment formulated to assist emerging or struggling small businesses with their accounting, compliance and business advising needs. 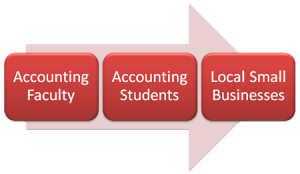 DSU's Accounting Training and Business Consultation Services program benefits both local community businesses and DSU Accounting Students. Faculty members, all certified public accountants, supervise students technically skilled in various business advising and entity structure issues along with mandatory accounting filing requirements. These students benefit by being able to practically use their academic training to advise business clients in business structure selection (Sole-Proprietership, LLC, Partnership, S Corporation, etc. ), tax filing requirements (past or present payroll/sales tax, etc. ), and accounting software selection and use (Quickbooks/Peachtree), allowing each student direct exposure to actual client engagement to prepare them for future employment. The Client then benefits from students who can give advice in accounting services such as becoming proficient in cash flow management, bank reconciliation, sales tax compliance, and business and personal tax returns. This program is available by appointment only. To get registered, please contact the program advisor, Todd Hess, thess@dixie.edu or (435) 879-4343. Each business will then be contacted by the student(s) involved to identify the clients' needs and expectations from the program.